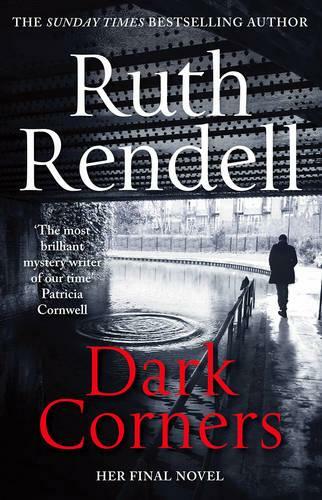 Ruth Rendell was, in crime writing terms, a genius. For decades, her remarkable books set a new standard in excellence. I discovered her work in my early twenties, and promptly devoured every story of hers that I could lay my hands on. In the books she published from the late 1990s onwards, however, I sensed a touch of repetition and perhaps even fatigue creeping in, as regards character types, settings, and plot developments. Given how prolific she was, that was hardly surprising, and her books continued to be highly readable. Unfortunately, I found myself struggling to finish The Saint Zita Society, and I felt it better to take a break from her books. More recently, though, I've wanted to give her later books a go, and see how I felt about them. Dark Corners was her final novel, published posthumously in 2015 following her death earlier that year. The last words of the books are truly poignant. They are: "'now it's all over'". And so it was. In the story, this phrase refers to an act of redemption which concludes a typically involved narrative with several plot strands. The lead character is Carl, who unwisely gives some pills to a female friend and accepts money for them. The friend dies, and Carl is distraught. He feels guilty, although actually he has committed no crime. When he is blackmailed by someone who is aware of what happened, he submits meekly until eventually he can tolerate things no longer. Carl is in some ways typical of Rendell's young male protagonists, but I found his behaviour less than convincing. Part of her genius (and the same is true of Patricia Highsmith at her best) lay in making extraordinary courses of conduct seem almost inevitable. For me, though, Carl didn't really work as a lead character. Similarly, there is a truly Rendellesque sub-plot, but it's rather half-hearted and unsatisfactory. On the plus side, the story is very readable. I raced through it, and thought it much more gripping than The Saint Zita Society (I'll have to battle to the end of that one eventually and see if I've judged it too harshly). Dark Corners certainly is infinitely superior to Agatha Christie's sad finale, Postern of Fate. It's not, however, in the same league as her twentieth century stand-alones.